Most of the volumes in the “HBR Guide to” series consists of anthologies of articles previously published in Harvard Business Review in which their authors share their insights concerning a major business subject such as Better Business Writing, Getting the Right Work Done, and Project Management. As is also true of volumes in other such series, notably HBR Essentials, HBR Must Reads, and HBR Management Tips, HBR Guides offer substantial value in cutting-edge thinking from 25-30 sources in a single volume at a price (each at about $12-17 from Amazon in the bound version) for a fraction of what article reprints would cost. 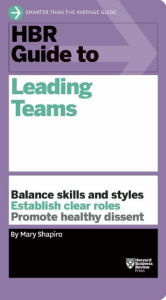 What we have in this volume is material created by one thought leader, Mary Shapiro, in collaboration with HBR Editors. She presents a three-stage process — Build Your Team’s Infrastructure, Manage Your Team, Close Out Your Team — and devotes a separate section to each. Shapiro seems to be a diehard pragmatists, eager to share everything she has learned about leading teams: what works, what doesn’t, and why. Presumably she agrees with Warren Bennis that “managing people is like herding cats.” (That’s the title of one of his most popular books.) In today’s global marketplace, with multi-cultural demographics within a multi-national framework, managing people may seem more like herding kangaroos on steroids. I was previously unfamiliar with Shapiro’s work and welcomed this opportunity to share her thoughts and feelings about how, when leading teams, to “balance skills and styles, establish clear roles, and promote healthy dissent.” Over time, there have been countless great teams in athletics (e.g. 1927 New York Yankees), science (the Manhattan Project), entertainment (the Disney animators who created Bambi and Pinocchio) and in business (Xerox PARC and Lockheed’s “Skunk Works”). With all due respect to teams that have several dozen members, I presume to suggest that some of the greatest breakthroughs in human achievement were achieved by teams of only two or three. In business, for example, pairs such as Walt and Roy Disney (Disney), Bill Hewlett and Dave Packard Hewlett-Packard), Warren Buffett and Charlie Munger (Berkshire Hathaway), Howard Schultz and Howard Behar (Starbucks), Bill Gates and Paul Allen (Microsoft), Steve Jobs and Steve Wozniak (Apple), Ben Cohen and Jerry Greenfield (Ben & Jerry’s Ice Cream), Sergey Brin and Larry Page (Google), and Jerry Yang and David Filo (Yahoo!). There have also been several great trios. My point is, great teams do not have to be large but all great teams need leadership as well as members who, together, possess outstanding talent, skills, and experience sufficient to the given challenge. With only minor modification, almost all of the material that Mary Shapiro provides can be of great value to those who lead any team, whatever its size and nature may be. Those who share my high regard for this volume are urged to check out three others: Patrick Lencioni’s The Five Dysfunctions of a Team: A Leadership Fable; Team Genius: The New Science of High-Performing Organizations, co-authored by Rich Karlgaard and Michael S. Malone; and Organizing Genius: The Secrets of Creative Collaboration, co-authored by Warren Bennis and Patricia Ward Biederman. ← Business Bestsellers or Best Business Books?